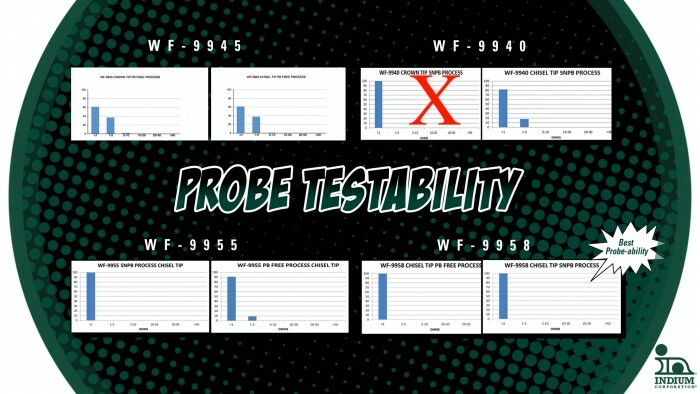 Probe testability is the last of the IPC tests. This test measures the nature of the flux residue to determine whether it interferes with the post-soldering electronic probe testing of the circuit board residue. In order to optimize these test results, two types of probes were used – a chisel-tip probe and a crown-point probe. The chisel-tip probe is the more difficult test to attain perfect results. PCB-40 (or WF-9940) was developed and tested under J-STD-004A, when SnPb was more common, so it was tested after a SnPb wave soldering profile. All-Star Engineer, The Alchemist, and Shadow Warrior were all tested with only a chisel tip after two different temperature profiles – a SnPb (cooler) process, and a Pb-free (hotter) process. The results are measured along the X axis as resistance and the Y axis indicating the percentage of testing showing that resistance. A score of 100% indicates perfect zero resistance, which means the residue left after soldering did not interfere with electrical testing. The chart here shows that, in general, hotter profiles yielded tougher residues and the crown tips penetrated better than the chisel tips. It also shows that Shadow Warrior (WF-9958) tested perfectly under all conditions. As you can see, the Project 99 team has the skills and abilities to defeat any wave soldering villain, improve process yields, and defend against reliability concerns.